L’Observatoire des Amériques (ODA), en partenariat avec le Laboratoire interdisciplinaire des études latino-américaines (LIELA), est fier de vous inviter au deuxième dîner-causerie de l’hiver 2019. 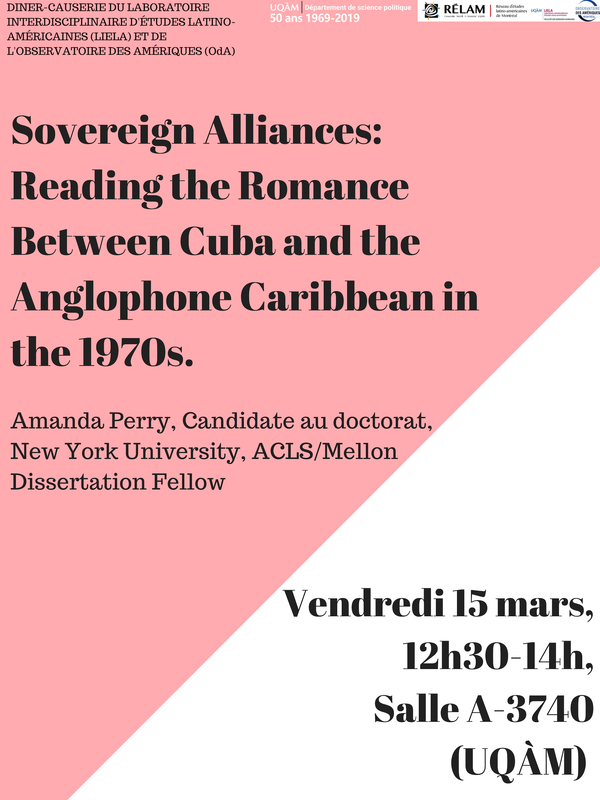 Amanda Perry, candidate au doctorat à la New York University et ACLS/Mellon dissertation fellow nous présentera la conférence : "Sovereign alliances : reading romance between Cuba and the anglophones Caribbean in the 1970s"
La présentation se fera en anglais. In the 1970s, the governments of Guyana and Jamaica pursued highly publicized allegiances with communist Cuba, while the People’s Revolutionary Government of Grenada would establish an even stronger alliance after coming to power in 1979. These political connections in turn fostered an explosion of cultural exchanges, but neither were justified primarily through the rhetoric of shared socialist projects ; instead, they focused on the need for regional sovereignty, rejecting U.S. hegemony but also seeking to establish cross-Caribbean relationships outside of Cold War binaries. This talk focuses on two ways that the relationship between Cuba and the Anglophone Caribbean was performed : through official state visits, which often included orchestrated and highly theatrical mass rallies ; and through cultural events, particularly the pan-Caribbean arts festival Carifesta and conferences hosted by the Cuban publishing house Casa de las Américas. These events and their surrounding discourses sought to produce pan-Caribbean solidarity in defiance of the U.S. blockade of Cuba, but they also had an uneasy relationship to black transnationalism, which threatened to reveal the fault lines within and across national bodies. That said, while Anglo-Caribbean politicians and intellectuals championed ties to Cuba as signs of sovereignty, the U.S. government instead framed them as evidence that Guyana, Jamaica, and Grenada were becoming Cuban, and thereby Soviet, satellites, rhetoric that would ultimately justify the invasion of Grenada in 1983. Le Laboratoire interdisciplinaire des études latino-américaines accueille le pôle UQAM du RELAM (Réseau d’études latino-américaines de Montréal), un espace de collaboration pour la « communauté latino-américaniste » des quatre universités de Montréal (Concordia University, McGill University, Université de Montréal et UQAM).